This project documents my adventures in learning how to wire up my home for wireless power monitoring. I live in a rented apartment so I don’t have hacking-access to a meter or breaker panel. Since I’m still very interested in measuring my power usage on a long term basis, I built wireless outlet reporters. Building your own power monitor isn’t too tough and can save money but I’m not a fan of sticking my fingers into 120V power. 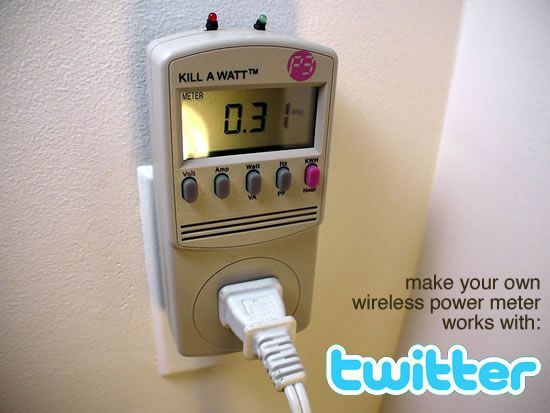 Instead, I’ll used the existing Kill-a-watt power monitor, which works great and is available at my local hardware store. My plan is to have each room connected to a 6-outlet power strip which powers all the devices in that room (each kill-a-watt can measure up to 15A, or about 1800W, which is plenty!). That way I can track room-by-room usage, for example “kitchen”, “bedroom”, “workbench”, and “office”. You should only attempt this project if you are comfortable and competent working with high voltage electricity, electronics and computers. Once the project is complete it is enclosed and there are no exposed high voltages. However, you must only work on the project when its not plugged in and never ever attempt to test, measure, open, or probe the circuitboards while they are attached to a wall socket. If something isn’t working: stop, remove it from the wall power, then open it up and examine. Yes it takes a few more minutes but it’s a lot safer! Don’t forget to learn how to use your multimeter too! There are a few tools that are required for assembly. None of these tools are included. If you don’t have them, now would be a good time to borrow or purchase them. They are very very handy whenever assembling/fixing/modifying electronic devices! I provide links to buy them, but of course, you should get them wherever is most convenient/inexpensive. Many of these parts are available in a place like Radio Shack or other (higher quality) DIY electronics stores. I recommend a “basic” electronics tool set for this kit, which I describe here. Soldering iron. One with temperature control and a stand is best. A conical or small ‘screwdriver’ tip is good, almost all irons come with one of these. Solder. Rosin core, 60/40. Good solder is a good thing. Bad solder leads to bridging and cold solder joints which can be tough to find. Dont buy a tiny amount, you’ll run out when you least expect it. A half pound spool is a minimum. ‘Handy Hands’ with Magnifying Glass. Not absolutely necessary but will make things go much much faster. We’ll start with the receiver hardware, that’s the thing that plugs into the computer and receives data from the wireless power plug. The receiver hardware does ‘double duty’, it also is used to update the XBee’s modems’ firmware (which, unfortunately, is necessary because they come from the factory with really old firmware) and configure the modems. Description A USB-to-serial converter. Plugs in neatly into the Adafruit XBee adapter to allow a computer to talk to the XBee. Description We’ll be using the XBee “series 1” point-to-multipoint 802.15.4 modules with a chip antenna part # XB24-ACI-001. They’re inexpensive and work great. This project most likely won’t work with any other version of the XBee, and certainly not any of the ‘high power’ Pro types! Find your FTDI cable – use either 3.3V or 5V. These cables have a USB to serial converter chip molded into them and are supported by every OS. Thus configuring or upgrading or connecting is really trivial. Simply plug the cable into the end of the module so that the black wire lines up with GND. There is a white outline showing where the cable connects. 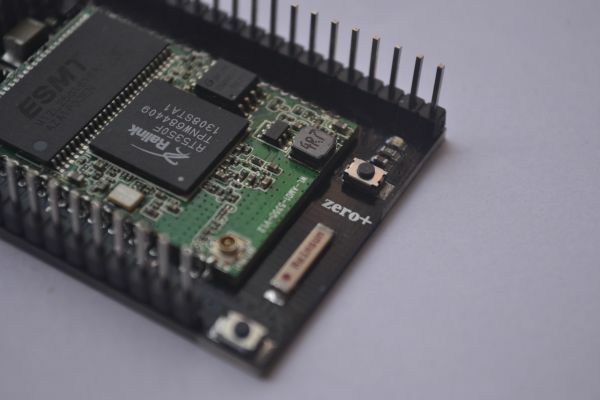 There’s a good chance your XBees are not running the latest firmware & there’s a lot of features added, some of which we need to get this project running. So next up is upgrading! Both XBee’s need to be upgraded with the latest firmware but only the transmitter (which is going to be put inside a Kill-a-Watt) needs to be configured. The configure process tells the XBee what pins we want to read the sensor data off of. It also tells the XBee how often to send us data, and how much. 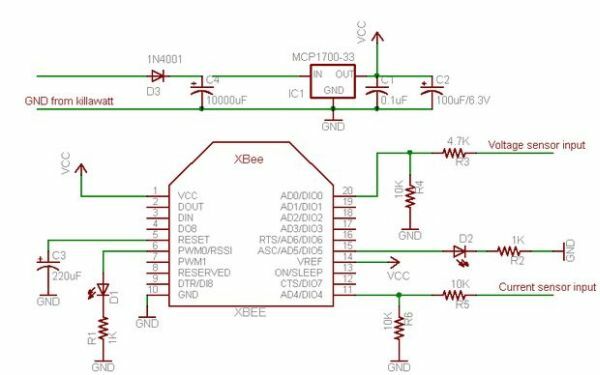 Basically what this means is that we’ll have all the XBees on a single PAN network, each XBee will have a unique identifier, they’ll stay in sleep mode most of the time, then wake up every 2 seconds to take 19 samples from ADC 0 and 4, 1ms apart. If you’re having difficulty, make sure you upgraded the firmware! Make sure to WRITE the configuration to the XBee’s permanent storage once you’ve done it. If you’re using X-CTU click the “Write” button in the top left. If you’re using a terminal, use the command ATWR ! Note that once the XBee is told to go into sleep mode, you’ll have to reset it to talk to it because otherwise it will not respond and X-CTU will complain. You can simply unplug the adapter from the FTDI cable to reset or touch a wire between the RST and GND pins on the bottom edge of the adapter. Description: We’ll be using the XBee “series 1” point-to-multipoint 802.15.4 modules with a chip antenna part # XB24-ACI-001. They’re inexpensive and work great. This project most likely won’t work with any other version of the XBee, and certainly not any of the ‘high power’ Pro types! 1. We want to run the XBee off the Kill-a-Watt’s internal power supply. However its current limited and wont provide 50mA in a burst when the XBee transmits. We solve this by adding a simple ‘rechargeable battery’ in the form of a really large capacitor C4. Open up your kit and get out the parts for the transmitter. Remember that we’ll be using most of but not all of an XBee adapter kit. The two small LEDs, the 74HC125N chip, a 10K and 1K resistor are not used and you should put them aside for a future project so you don’t accidentally use them here. Check to make sure you’ve got everything you need. The only thing not shown here is the XBee radio and Kill-a-Watt. We’ll start by soldering in the 3.3V regulator, which is identical to the standard XBee Adapter kit you made in the receiver instructions. Don’t forget to check the polarity of C2 and that IC1 is in the right way. Then solder and clip the three components. Cut a 1/2″ piece of 1/16″ heat shrink and slip it onto the yellow wire, making sure there’s clearance between the heatshrink and the end of the wire. Then solder the yellow wire to the 4.7k resistor. Now we will build the voltage divider. Take the two 10K resistors and connect them as shown. One goes from AD0 and one from AD4. Both then connect to ground. Conveniently, the chip we are not using had grounded pins so we can ‘reuse’ those pins. We’re nearly done with the adapter soldering. Lastly is the 220uF reset capacitor. We’ll connect this to the RST pin, 5th from the top on the left. Make sure the long lead is connected to the RST pin and the shorter lead goes to the 4th pin of where the chip would go. Check the photo on the left to make sure you’ve got it in right. … and what it should look like with the XBee modem installed. Make sure the pins on the XBee line up with the header. Clip the long leads down. You’ll need to use the “-” stripe to keep track of which pin is negative and which is positive. Clip the cathode lead down of the 1N4001 diode, that’s the end with the white stripe. on it. Solder the diode so that the white-stripe side is connected to the positive pin of the big capacitor. Take the black and white ribbon from earlier. Split, strip and tin the four ends. Cut a 1″ piece of 1/8″ heatshrink and slip it onto the white wire. Slip a 1/2″ piece of 1/16″ heat shrink onto the black wire.